Have you been inspired by one of those home makeover shows? Is it time to update the interior of your Minneapolis, MN home? Bannochie Builders, Inc. is a Licensed Home Remodeling Contractor with 25 plus years of experience. Whatever you in-vision for your home, we can help to make it a reality. Our skilled team provides homeowners with the opportunity to dream big. You can be proud to show off your home’s before and after photos. Let us transform a problem area of your home into your family’s favorite new space. We do Kitchen Renovations, Bathroom Remodels, Basement Finishing and much more. The heart of your home deserves special attention. Older Minneapolis kitchens often feel cut off from the rest of the living area. Kitchen Renovation Solutions from Bannochie Builders, Inc. could include a functional update or creation of an open kitchen space. 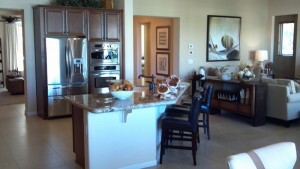 Add an island for more counter space, convenient eat in kitchen area and additional storage. New cabinets can instantly transform a kitchen with increased function and style. Updated flooring can add cohesiveness with your rooms and bring the design into this century. Backsplashes can add a dash of color that shows off your style. Countertops are available in many durable, low maintenance materials that are perfect for any kitchen. Lighting fixtures, appliances and paint are the finishing touches. Bathrooms are one of the most important areas of your home. 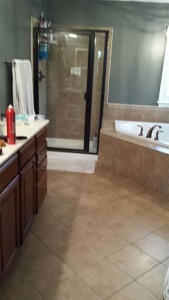 Updating an outdated bathroom adds value and function to your Minneapolis, MN home. Popular Bathroom Remodeling ideas right now include transforming an ordinary bathroom into a spa-like retreat. Remodeling an Unfinished Basement space can add incredible living space. You can gain functional and valuable square footage that was right under your feet. Imagine the possibilities with Basement Finishing by a Licensed Remodeling Contractor like Bannochie Builders, Inc. We take every step to ensure that your Minneapolis, MN basement with be dry and comfortable for your family. Proper waterproofing, insulating, flooring, drywall and lighting makes all the difference. Contact Bannohie Builders, Inc. for innovative ideas to transform the interior of your home. As a Licensed Home Remodeling Contractor, we can handle home renovation projects of any size and scope. Kitchen Renovations and Bathroom Remodels are two of the projects that provide the most impact. We also provide expert Basement Finishing services to optimize the space and function of your Minneapolis, MN home. Minneapolis homeowners should Contact us today for a Free Estimate on Kitchens, Baths and Basements. Fully Licensed, Bonded and Insured. This entry was posted	on Wednesday, May 13th, 2015 at 3:13 pm	and is filed under Home Remodeling, Interior Home Remodeling. You can follow any responses to this entry through the RSS 2.0 feed. You can leave a response, or trackback from your own site.